Oklahoma educators are striking over some of the deepest school spending cuts in the nation. More than 40,000 teachers and thousands of support staff across Oklahoma pledged to walk off their jobs. The statewide walkout has shuttered schools across the state. Education funding in the state has fallen 30 percent over the last decade. Oklahoma spent a little more than $8,000 per student in 2015, far below the national average of $11,400. According to the National Education Association, Oklahoma teachers ranked 49th in teacher pay in 2016. Many teachers in the state are working second and third jobs to make ends meet. Students are also feeling the impact of dwindling financial support for education. One student said the crumbling classrooms make it difficult to learn. Textbooks for students are often outdated, missing pages, or there’s not enough of them to go around. State lawmakers have continually pledged to give teachers raises and restore education funding, but have repeatedly reneged on their promises. This year, lawmakers again cut the education budget, prompting the strike. Educators and their supporters in the tens of thousands rallied at the state Capitol in Oklahoma City. Last week, state lawmakers passed a measure increasing teacher pay by an average of $6,100 and giving schools an additional $51 million in funding. The bill fell far short of teachers’ demands. Some superintendents left it up to teachers to decide whether to walk out. Many teachers remain frustrated that the state did little to reverse a decade of cuts. 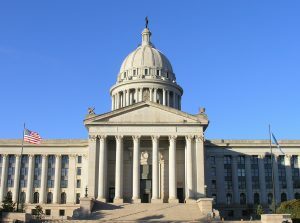 Oklahoma Education Association President Alicia Priest said, “This package does not overcome a shortfall that has caused four-day weeks and overcrowded classrooms that deprive kids of the one-on-one attention they need.” Unless lawmakers increase education funding, the teachers will not return to work. In recent weeks, educators have revolted in states where tax cuts have drained state funding for schools. West Virginia teachers won a 5 percent raise after a nine-day strike. Teachers in Arizona have threatened to strike if they do not get a 20 percent raise and more money into the schools. In Kentucky this week, teachers shut down schools in a dozen districts over teacher pension reforms.